Senate Majority Leader Mitch McConnell, R-Ky., talks to reporters at the Capitol on Tuesday about his decision to delay a vote on the GOP health care bill. 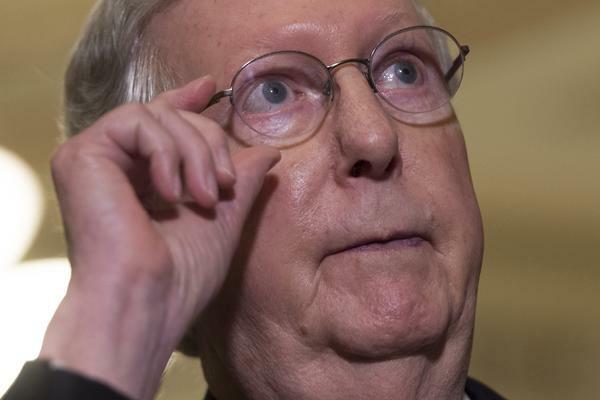 "We're still working toward getting at least 50 people in a comfortable place," Senate Majority Leader Mitch McConnell said Tuesday at a press conference on Capitol Hill. Despite the delay, McConnell confirmed that Republican senators were heading to the White House to meet with President Trump later in the afternoon to continue work on the issue. If three Republicans oppose the bill, it cannot pass. The GOP holds 52 seats, with Vice President Pence as a potential tiebreaker. The delay was announced with at least five Republicans indicating they were against bringing the bill to the floor this week. "Several of them want more time," McConnell said. "We have a number of different discussions going on, that have been going on for six weeks. They continue." He made the announcement during Senate Republicans' weekly lunch, which was attended by Vice President Pence. White House chief of staff Reince Preibus and press secretary Sean Spicer were in the Capitol on Tuesday, as well. It's expected the bill will be altered and get a new score from the Congressional Budget Office before it comes back up. Leaders had been pressing hard for a vote before the holiday. Majority Whip John Cornyn of Texas tweeted Monday morning, "I am closing the door. We need to do it this week before double digit premium increases are announced for next year." There has been speculation that McConnell had been prepared to bring the bill to the floor, even if it can't pass, so the Senate can move onto its next big priority: tax reform. Sen. Susan Collins, R-Maine, said late Monday that she would vote "no" on a motion to proceed, a procedural step that needs to be taken before a floor debate can even begin on the bill. If two more Republicans were to have voted no on that motion, the bill would have died. Collins cited a report from the Congressional Budget Office released Monday that said the bill would result in 22 million fewer people with health care coverage over the next decade, compared with under the Affordable Care Act, also known as Obamacare. Much of that reduction would be because of the rollback of the ACA's expansion of Medicaid, which Collins and other Republicans in states that took up the expansion funds have expressed serious reservations over. Alaska Sen. Lisa Murkowski had similar concerns to Collins'. "I need to understand really what we're talking about, with some of the conclusions that we saw yesterday with the CBO score," she told MSNBC. "Taking the time to get it right is where we should be." Democrats held a protest on Capitol Hill on Tuesday. Senate Minority Leader Chuck Schumer told reporters, "We know the fight is not over. That is for sure. We're not resting on any laurels, nor do we feel any sense yet of accomplishment, other than we are making progress because the American people are listening to our arguments." But the hurdle for McConnell remains divisions within his own party. Conservative Republicans including Sens. Mike Lee of Utah, Ted Cruz of Texas and Rand Paul of Kentucky had indicated they were very likely to vote no, as they push for greater spending cuts and reduction of regulations on health insurers. Other GOP senators who appear strongly opposed include Dean Heller of Nevada, who excoriated the bill at a press conference on Friday mostly over its cuts, and Ron Johnson of Wisconsin, who had been urging leaders to wait on a vote until after next week's recess. The House failed to advance a bill to repeal and replace Obamacare in late March, and it was seen as a spectacular failure on the GOP's most persistent pledge to voters for the past seven years. After rounds of negotiations and amendments, the House passed its bill in early May. The outlook for delaying the bill is tricky. Leaders have been insistent that they need to move on to other issues. To take up tax reform or funding the government in 2018, Senate procedure would require them to scrap the health care effort altogether. Republicans have expressed grave warnings about what that could mean politically. Polls have shown the Republican health care effort is very unpopular overall, with even GOP support for the House bill at just 34 percent in an NBC/Wall Street Journal poll released last week. But that same poll showed that 71 percent of Republicans support repealing the Affordable Care Act, and it would be risky for the GOP to head into the 2018 midterms having failed their base on that pledge. "I would not bet against Mitch McConnell," House Speaker Paul Ryan, R-Wis., told reporters Tuesday morning when asked about the bill's fate — but before news broke of McConnell's announcement that he was pushing the vote back. "He is very, very good at getting things done through the Senate, even with this razor-thin majority. I have every expectation that the Senate — I don't know what day —but I have every expectation the Senate will move this bill." The speaker nodded to the political pressure the party is under to deliver on their signature campaign pledge. "Every Republican senator campaigned on repealing and replacing this law," he said. The Senate bill repeals the individual mandate to carry health care coverage and the employer mandate for businesses with at least 50 employees to offer coverage. It also repeals most of the taxes enacted under the ACA, which mostly affect high-income earners and corporations, in addition to rolling back federal subsidies and the expansion of Medicaid. It would allow people up to age 26 to remain on their parents' plans, and it would bar insurance companies from denying coverage to those with pre-existing conditions. Republicans revised the bill on Monday to add a penalty aimed at preventing people from signing up for coverage only once they are sick, which most experts predict would sink the insurance market. "I'm a 'no' on it unless the bill changes," Paul said to reporters on Monday. He has called the bill "Obamacare Lite" and is seeking a fuller rollback of the ACA. But the changes he wants seem unlikely to be included or would risk losing too many moderates because they would further reduce benefits from the federal government. One frequent critic of Trump, Sen. Lindsey Graham, R-S.C., was quoted by The Hill as saying Monday, "If you're counting on the president to have your back, you need to watch it." The president confirmed reports last week that he had privately criticized the House version of the health care bill as "mean," even though he invited Ryan and members of the House GOP leadership over to the White House Rose Garden for a celebration after it passed. Graham also has said that waiting until after next week's recess is not likely to make it any easier to pass a bill. The White House led criticism of the CBO report on Monday, assailing its ability to estimate effects on coverage. But Ryan defended the Congressional Budget Office, which has also come under fire by outside conservatives and some Republicans in Congress. "It is important that we have a scorekeeper," he said. "We can always complain about the nature of the score. I think their coverage numbers — there's more to the story than the number implies. Having said that, it's important that we have a referee." Many Republicans have taken issue with the CBO forecast, arguing that they believe more Americans will be inclined to sign up if cheaper plans are available. Republicans often note that millions of Americans have opted to pay fines in lieu of signing up for coverage under the ACA.